This sign has been posted for several months at our local laundromat at Westchester and Sands in the Pelham Bay Park area of the Bronx. So we can bring our dog in, as long as it doesn’t have a permit?! 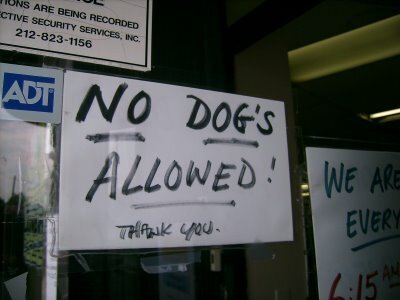 Technically this one is gramatically correct — no dog is allowed.